I think this might be my first article on a Blackberry phone. The constant complaint from seasoned Blackberry owners has been the absence of a traditional keyboard from smartphones. The Blackberry Priv is the phone that Blackberry owners were waiting for. It has a pull out keyboard which slides out from the bottom of the phone. The Blackberry Priv features Google’s Android 5.1.1 Lollipop. Sporting a 5.4″ diagonal display and a feature shared with the popular Apple iPhone lineup, a finger scanner, this is a great phone for Android fans. The camera is top of the line and features a 18 MP lens. The Blackberry Priv has a generous 32GB of storage and has an impressive 22.5 hours of battery life. We will get to car and motorcycle mounts for the BlackBerry Priv in a moment but first some important specifications. With a well sized 5.4 inch diagonal screen, this phone measures 5.79 x 3.04 x 0.37 in inches (147 x 77.2 x 9.4 mm) and weighs in a a little more than 6 ounces which is fairly standard. These are important measurements to keep in mind when selecting your mount. I’m not aware of any custom mounts for the Blackberry Priv so we are going to recommend mounts with universal holders. Because of the larger size, not all mounts are going to fit. You will need a mount with a larger expandable cradle, especially if you are using a case or skin which is always recommended. If you already have a mount for your older phone, it may already fit especially if it is an older Blackberry. Many universal mounts offer options to upgrade your cradle to a larger one but if not, you will need to purchase a new mount. Be very aware of the size of the cradle, this large phone won’t fit into just any mount. Be sure to measure your phone before selecting a new mount or cradle and remember, if you have a case or skin, the dimensions are even larger. This phone costs a lot money. Buy a case for it. I have always been a big fan of the Otterbox Defender series but I do not believe they make cases for the Blackberry Priv. Fortunately Blackberry does make a slide out case which while not as good as an Otterbox Defender, should add some protection for your device. A single drop on ceramic tile that results in a broken lens will cost way more than the case. If you think insurance will cover you, think again. Insurance policies purchased from your carrier have a deductible and for newer more expensive phones that can be $169 on up. So to add insult to injury, you will not only be paying the monthly insurance premium, but you will then pay the deductible. You can read our article on phone insurance here. Bottom line is buy a case. I’ve dropped my phone on the driveway from six feet up and it didn’t receive any damage at all thanks to the case. For the car, give the location of your mount some thought. There are lots of places to mount your Blackberry Priv. The windshield is the most popular location to mount especially if you plan to use it as a GPS with my favorite application which is Waze. We have recommended the Arkon’s Slim Grip Ultra Travel Mount many times over the years and will continue to do so until I see anything more versatile for the price. This mount features an expandable cradle which expands to 7 inches using a spring-loaded bottom. The support arms move so that you can expose any ports or buttons. This will fit your phone with or without a thick case. The mount comes with an adhesive dash plate so that you can attach to the mount to your dash as well as your windshield. 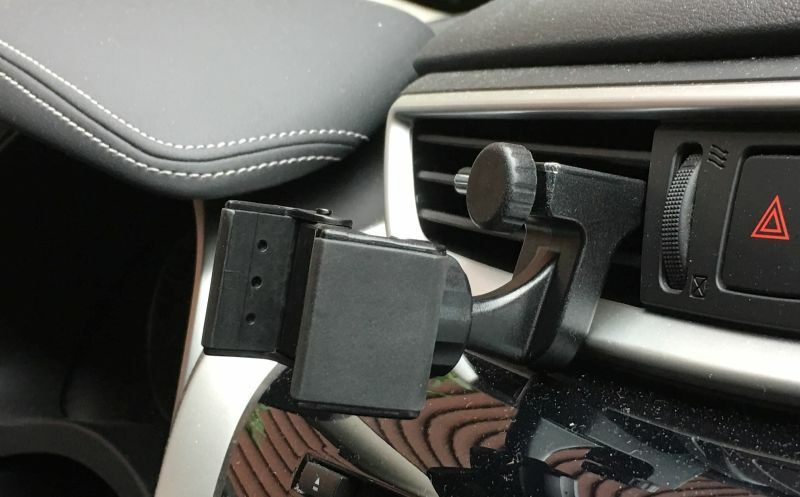 For a different location for your Blackberry Priv, consider the iKross Car Cup Holder Phone Mount. The cup holder base is expandable from 2.7 to 3.7 inches. It will fit almost any vehicle’s cup holder. There is a 12″ flexible stem that allows bending of the mount to the right angle for the driver or passenger. The phone can rotate 360 degrees into portrait or landscape and is easy to insert and remove. The expandable cradle opens to 8 inches so it will fit your phone with or without a case or skin. Another interesting location for your Blackberry Priv is the car air vent. For something a little different, consider the Square Jellyfish Jelly-Grip Car Air Vent Mount. The Square Jellyfish Jelly-Grip mount can be used to hold most phone models with or without a case or skin. It has a ball and socket so the cradle so has the capability to be oriented downwards towards the driver versus the roof. This mount will work on flat vent slats that are 3/8 to 1 inch deep. The included cradle opens to 3 5/8 inches which is large enough for the Blackberry Priv with or without a case or skin. For motorcycle use, it’s important that you select a mount that will hold your Blackberry Priv tightly so that it stays secure in high vibration environments. Consider the RAM X-Grip IV Handlebar Mount. The RAM X-Grip line consists of well made cradles. These are heavy-duty mounts that are mostly constructed of metal. The mount has gone through some rigorous shake tests and holds up well on a motorcycle. We wrote about X-Grip holders extensively on this site and you can view that article here. These mounts feature the expandable X-Grip IV cradle which can open to 4.5 inches which is large enough for most cases or skins. These mounts fit handlebars up to 1.25 inches diameter and come with a lifetime warranty. A similar mount for motorcycle clutch attachment is the Heavy Duty Brake Clutch Bike Motorcycle Mount Holder for Large Phones/Phablets . This mount has the same X-Grip cradle that’s included in the mount we just discussed but also includes an attachment to the clutch or brake reservoir. This mount is especially popular on a Honda Goldwing which doesn’t have any handlebar real estate for mounting. We also have seen these on many Harley-Davidson models. The mounting kit includes bolts which replace the manufacturer ones. Be sure to follow the manufacturer directions for attachment and while the installation isn’t difficult, use a mechanic to install if you don’t feel comfortable working on your bike. When using a motorcycle mount, we always recommend tethering your device for added security.